As our flagship product we have developed a medium/dry cider that has soft tannin, low acidity and a gentle sweetness. This gives good balance, complemented with depth of flavour. 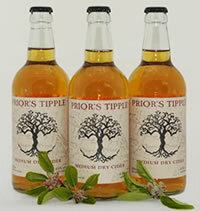 It has broad appeal amongst both occasional and experienced cider drinkers of all tastes. This is supplied as a bottled and draught product and is available all year from our outlets listed below. As well as this cider we bottle small quantities of vintage blends, single orchard ciders, bottle conditioned products and perry. The availability of these products varies according to changes in fruit yeald from one year to another. This cider is clear and sparkling. It makes an excellent accompaniment to pork, cheeses and spicy food or can be enjoyed on its own. It should be well chilled and served in a glass. Sip or gulp depending on mood! Supplied in cases of 12, 500ml bottles. A rich, dry aged cider for a drink with real distinction. 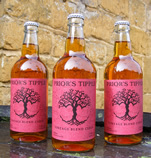 Our vintage blend cider is made from a blend of vintage varieties of bitter sweet cider fruit only. These varieties are called vintage because they have outstanding qualities. Drier and much less carbonated than the medium/dry, vintage is a rich cider with deep fruity flavors, prominent tannins and a light fizz on the tongue. This cider is aged in vats during which time the tannins soften to give oaky flavors and subtle spicy notes. This comes as a medium/dry, although sweetness can be adjusted if requested. A more rustic cider than our bottled product, it has a slight cloudy haze and is still. This makes a fantastic session drink, ideal for large gatherings or parties and is available on tap in some of the pubs we supply. It should be served at room temperature. Supplied in 25 litre (approx. 40 pint) poly keg, with pouring tap. Clear, spakling and aromatic, our perry is a delicate and refreshing drink. It should be regarded more like a wine than a cider so serve well chilled in a wine glass. A light and delicate, still drink. Great for catering for large number at gatherings, especially on a hot day. 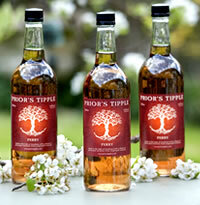 We are always looking to expand our outlet group in order to bring Prior's Tipple to a wider audience. Please contact us to discuss prices and promotional incentives for new outlets. We are also happy to supply small quantities on an experimental basis. Prior's Tipple is produced and supplied by Isaac Nixon.